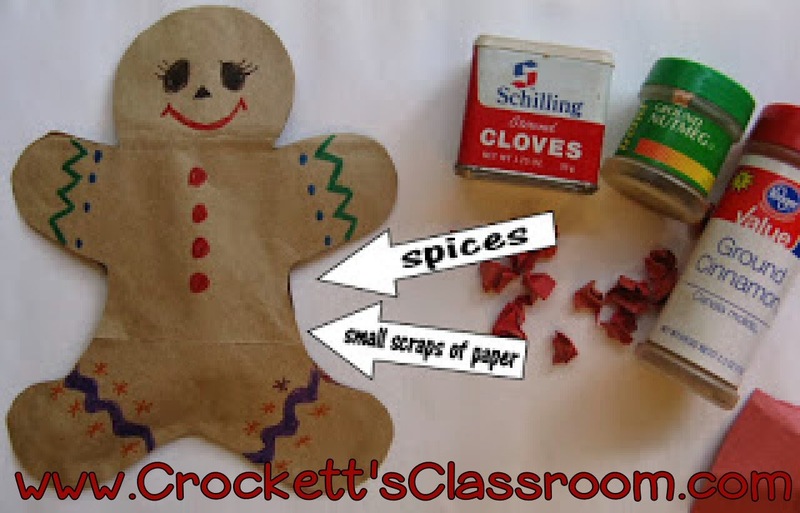 Materials: gingerbread man template, large brown paper bags (have the kids bring them in), glue, spices (ginger, cinnamon, allspice, nutmeg, or any other spice you have that smells like yummy cookies, small pieces of scrap paper. 1. Copy patterns heavy card stock or lightweight cardboard to use as a tracing template. I usually had one template for every 4 students to share. You can use the templates for many years. 2. Students trace and cut out two gingerbread men from the brown paper bag. It’s okay if there is printing on the bag. It can be on the inside of the gingerbread man. 4. Put glue around 3 sides of one gingerbread man piece. 5. Place the other gingerbread man piece on top and let the pieces dry for 10-15 minutes. 6. Crumple the scrap paper and use it to put the stuffing into the gingerbread man through the open side. 7. Sprinkle in a few of the spices. 8. Glue the open side together. Clickhere for directions and pattern.